The revival of NCAA Football video games has just taken a huge step towards becoming a reality. In an announcement via Twitter, iMackulate Vision Gaming (IMV Gaming), the company behind the efforts to bring NCAA football gaming to the current generation, has revealed that the company has entered an agreement with Big Ant Studios. Big Ant Studios has worked on titles such as Casey Powell Lacrosse 16, and the recently released — and fully licensed — Rugby League Live 4. “We are very excited and humbled for the opportunity to partner with Big Ant Studios on Gridiron Champions,” IMV Gaming said in a press release. “We really love their portfolio of games and the opportunity they would provide our game to grow moving forward. 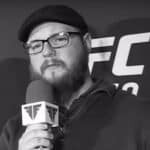 “Now that we have everything in place, we will continue to work relentlessly to obtain the necessary funding via our crowdfunding efforts as well as outside investors/sponsors. 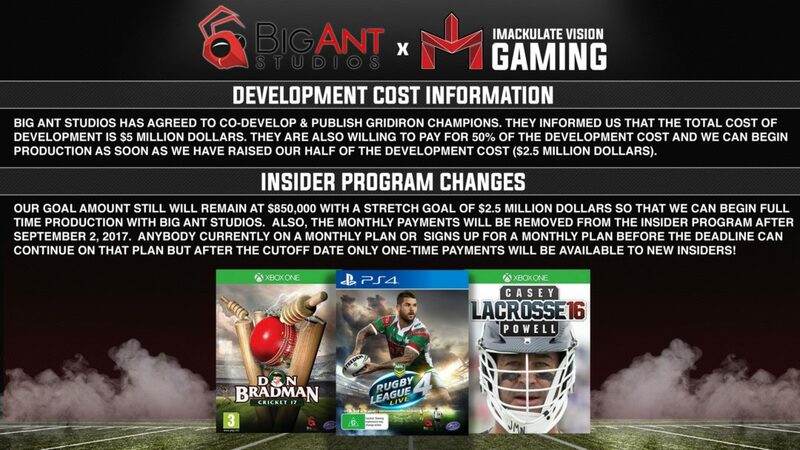 Lastly, we are working with independent designers to create visual concept art assets like player models so that the community and investors will be able to clearly see our vision for Gridiron Champions before we are able to begin full time production with Big Ant Studios. The agreement will see the Australia-based Big Ant co-develop and publish the upcoming Gridiron Champions. Big Ant will also cover 50% of the development cost of the game, which, according to their numbers, will come in at around $5 million. Gridiron Champions is currently scheduled for a 2019 release date on PC and the latest consoles, giving the team the time they want to hit their 2017 funding goal and spend the entirety of 2018 developing. That funding goal is set at $850,000 with a team stretch goal of $2.5 million to help cover their half of development costs. As of writing, IMV Gaming has raised nearly $150,000 towards development. The $2.5 million IMV Gaming is providing will come from both fan funding and outside investments. The game isn’t expected to be licensed come launch, but will feature 126 fully customizable generic schools to utilize in game. Players will be able to edit schools, uniforms, players, stadiums and more in order to tailor the college football experience to their liking. In addition, a full bowl and playoff system will be implemented to mimic what fans see from the modern-day NCAA. The team at IMV Gaming has stated in the past, however, that licensing is part of the future plans for the series. If released on schedule, a 2019 launch would put Gridiron Champions at six years past the last NCAA football game — NCAA Football 14.